Because neither the length of the text or the figure are necessarily consistent, we can’t use Left, Right or Mid. However, we can instead use the hyphen to work out where the description ends and the number begins. To do this we must first identify how many characters from the left there are before the hyphen. 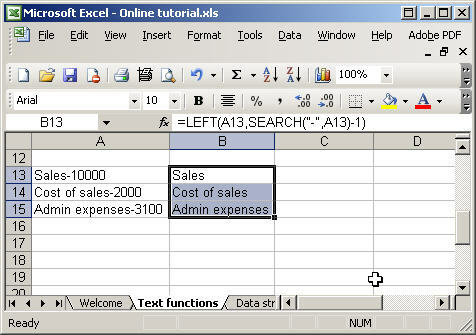 Note again that we can just type the hyphen into the ‘Find_text’ box and Excel will automatically add the speech marks. Note also that there is the option to specify the character position at which you want to start the search. This is useful if you need to locate more than one similar character – once you have found the first, you can start the next search from one character position higher. Our example is a simple one that doesn’t use the ‘Start_num’ argument and, as you can see, it returns the position of the hyphen as character 6. 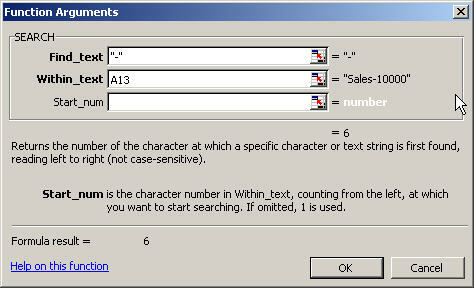 In the case of “Sales-10000” Len will return 11, the hyphen is at position 6, so 11-6 = 5, the number of characters in the amount. As you can see, the text values are now treated as numbers and Sum works correctly. In the following example we have part of an address that includes multiple spaces between ‘High’ and ‘Street’ and a carriage return character to separate the lines of the address. 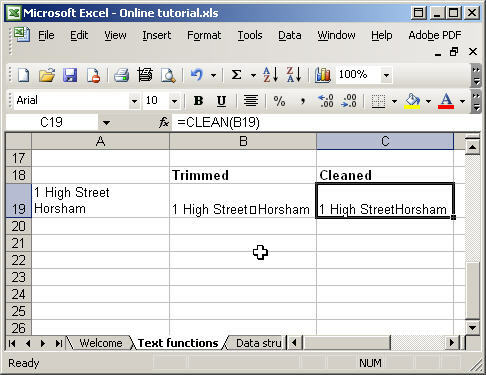 Note that the Trim function leaves a single space between High and Street, but that the Clean function removes the carriage return entirely. 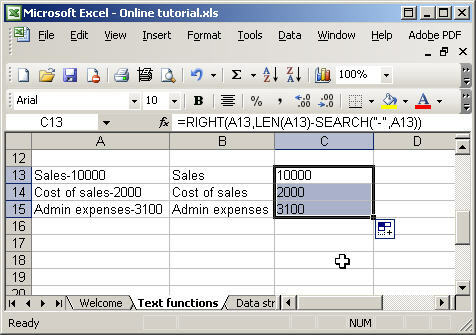 This entry was posted in Excel, Not quite so simple, Office software. Bookmark the permalink. 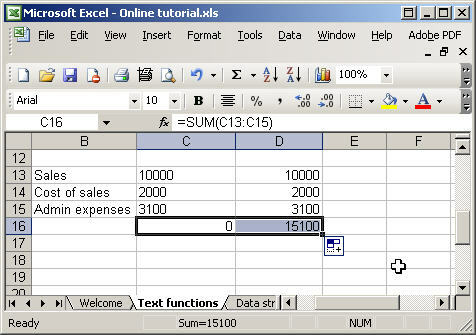 In your example of the sales-1000 etc I tried it using tools/text to columns using the – as the delimiter. It seemed to work in a simple example. how can i get only last parts of the values:34 and 35 ?